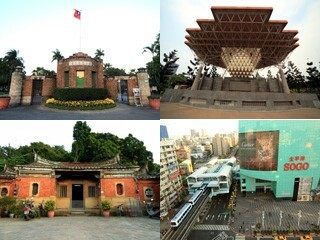 Daan District, located to the south of downtown Taipei City, is the most populous administrative district in Taipei City. The name “Daan” comes from its former name, Daan Village. In the district, there are talented people, developed commercial areas and convenient transportation. Daan District is the epitome of an international city and displays the unique style of an exemplary city. The main roads of Taipei City are placed like a checkerboard in Daan District, signifying the District’s importance in Taipei City in terms of traffic and transportation. The longitudinal roads include Zhongxiao, Ren’ai, Xinyi and Heping roads, while the transverse ones include Dunhua, Fuxing, Jianguo and Xinsheng roads. Among these roads, Zhongxiao East Road is the most important road that runs through the east-west axis of Taipei City. Along the road, there are many department stores, commercial buildings and restaurants. The checkerboard-style road system and the MRT network lead to convenient transportation and a highly developed commercial function. Along Gongguan and Shida roads, there are many shopping areas aimed at students, which attract featured and independent bookstores to start business here. Yongkang Street is a famous food and delicacy area in Taipei City. The Yongkang Shopping Area covers Yongkang Street, Lishui Street, Jinhua Street and the stores on nearby Xinyi Road. It is made popular by the well-known restaurants and finger food in the alleys. The East District Shopping Area generally refers to the area centered by Pacific Sogo, Breeze Center, Ding Hao Mall, and Ming Yao Department Store nearby Section 4 of Zhongxiao East Road. Linjiang Street Night Market, commonly known as Tunghua Street Night Market, is a tourist night market named as it is on Linjiang Street between Tunghua Street and Keelung Road. Moreover, there are Guanghua 3C Mall, Jianguo Holiday Flower Market, Jade Market and Wenchang Furniture Street.